Ivan Sproule scored against his old team to earn Ross County a deserved victory. 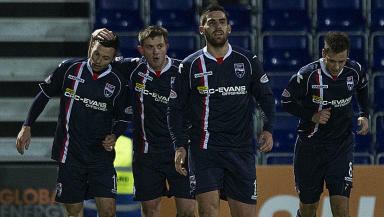 Ivan Sproule scored against his old team to earn Ross County a deserved victory over Hibernian in the Clydesdale Bank Premier League at Global Energy Stadium. It was County's third win in their last four matches and puts them 14 points ahead of the league's bottom club Dundee, with a game in hand. County were the first to threaten when Sproule backheeled a strong cross from Michael Kovacevic towards goal but it was easily cleared. Then Rocco Quinn blasted a long-range shot over the crossbar as the home side started well. Former Hibees player Sproule looked in the mood against his former team and he fired towards Ben Williams' near post - but the goalkeeper did well to smother the shot. At the other end Leigh Griffiths evaded his maker on the right but his shot failed to test Mark Brown and ended up in the side-netting. Smart interplay between Iain Vigurs and Evangelos Ikonomou almost opened up the Hibs defence but the Greek defender ran out of space. Eoin Doyle almost prised open the County defence with a diagonal ball but Griffiths just failed to keep it in play at the far post. However, it was the home side who took the lead in the 36th minute when a defence-splitting pass from Vigurs found Sproule in space and the winger rounded Williams and stroked the ball into the empty net. County produced the first opening of the second half when Kovacevic squared the ball for Quinn - but the midfielder's shot from the edge of the 18-yard box was straight at Williams. County's Boyd was the first booking of the night for a foul on Doyle 25 yards out. Griffiths took the free-kick but his shot was blocked by the County wall. 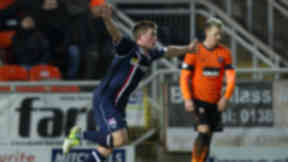 Gary Deegan tested Brown with a snapshot from 30 yards but the keeper made a comfortable save. A cross into the Hibs box from Sproule in the 65th minute fell for Vigurs but his ball back across goal was cleared to safety. German striker Steffen Wohlfarth made his debut in the 70th minute when he replaced the injured Sproule. Hibs had claims for a penalty turned down in the third minute of injury time when Griffiths tangled with Kovacevic but referee Bobby Madden saw nothing amiss and the home side were able to hold on for the three points.